Cocteau's Orphée has recently been classified by the BBFC for the BFI. Also : Colin Higgins' Nine to Five. You can vote for your favourite BFI releases of the year (and a whole lot more) in the Criterion Forum BAFTAS: here. I don't think its fair to vote for one's favorite BFI releases when they haven't even announced November or December's releases. In all fairness, I could already pick some BFI "best of 2018" releases that could very likely remain as such even with newer announcements. The Jarman set is top notch and I'm likely to include Distant Lives Still Voices somewhere anyway, but who would know if I made up my mind already or if I waited to know the Nov and Dec releases ? But outside of when you can vote, I'd expect people to be thoughtful about this element, and not to get too stuck on what they know already, giving some space for whatever the BFI might do in Nov and Dec, just in case. I'm already preparing these lists (because it's going to take more time this year), but I'm trying to keep an open mind. They kinda already have I think. Red, White and Zero (Flipside 036) and separate editions of Look Back in Anger and The Entertainer showing on their web store, all for December releases. Guess they might announce one or two more though - by announce I mean show up on Amazon or their own site. This is the BFI’s Blu-ray/DVD line-up for January – March 2019. PINTER AT THE BBC is a new 4-DVD set featuring 10 BBC adaptations of the great British playwright’s work, spanning the period 1965-1988. Many of these have not previously been available in any home entertainment format. Highlights include 1987’s The Birthday Party starring Julie Walters and Joan Plowright. ROGUE MALE is the 1976 BBC adaptation of Geoffrey Household’s much-loved novel. A thrilling tale of a man on the run, set on the brink of the outbreak of World War II, it stars the legendary Peter O’Toole and is directed by Clive Donner (Here We Go Round the Mulberry Bush). Coincidentally it also features Harold Pinter in a small role. Rogue Male will be released in a Dual Format Edition. ORPHÉE, Jean Cocteau’s 1950 masterpiece, comes to Blu-ray for the first time in the UK in a 2K restoration from the original camera negatives, following its current theatrical release. JARMAN VOLUME TWO 1986-1994. While the extensive content of this Blu-ray-only box set is not quite finalised yet, it will feature UK High Definition premiers of The Last of England, War Requiem, Wittgenstein, The Garden and Blue. As with Volume One, it will be packed with rare archive materials. MAURICE (1988): This superb new restoration of the landmark Merchant Ivory adaptation of E.M. Forster’s novel was re-released in cinemas this summer, introducing a new generation of filmgoers to a powerful romance starring James Wilby, Hugh Grant and Rupert Graves. It will available as a separate Blu-ray or DVD set. MIFUNE: THE LAST SAMURAI (2016): Toshiro Mifune, one of the acting legends of Japanese cinema (and star of Seven Samurai, the BFI’s best-selling DVD of all-time) is celebrated in this feature-length documentary directed by Steven Okazaki and narrated by Keanu Reeves. BFI FLIPSIDE – STRANGER IN THE HOUSE (aka Cop-Out), a 1967 crime film about the generation gap, starring James Mason, Geraldine Chaplin and US rock’n’roller Bobby Darin, is the next addition to the strand that rescues weird and wonderful British films from obscurity and presents them in new high quality editions on DVD and Blu-ray. BERGMAN – A YEAR IN A LIFE: After a theatrical run in January 2019, Jane Magnusson’s revealing new documentary that shows the darker, less well-known side of the great director will be released on DVD. In addition, there will be a limited edition Blu-ray box set featuring both the theatrical cut and the 4-part TV mini-series, which will be a must-buy for all serious fans of Ingmar Bergman. MR TOPAZE: After being unavailable for many years, Peter Sellers’ directorial debut from 1961 will receive a Dual Format Edition release. SEBASTIANE, Derek Jarman’s debut feature film from 1976, will be released as a stand-alone Blu-ray. The packshots can be seen in the BFI website news story here. The other centenary today is that of Margaret Tait and the BFI's new 2K restoration of her only feature film, Blue Black Permanent, is on limited theatrical release. Has anybody heard anything about a Blu-Ray release? I'll be surprised if the BFI doesn't give it one, but I would very much like to see it. Lux did a very nice DVD of Margaret Tait's short films a few years ago - its now long out of print and expensive. Would be nice if they or BFI or someone upgraded that to blu. The films are fantastic. I ordered it from them two years ago and received the Lux release (pressed disc in clear keepcase). For £10 I thought I might be getting a dvdr copy, was pleasantly surprised that it was the regular release. Beginning with these spring titles, our new releases will only include a booklet in the first pressing. Thanks for the tip! ordered. Cheaper than it ever was from Lux! It's especially useful information for massive box sets like this, but it's valuable even for single discs, since I tend to graze on special features of recent watches for a while after, rather than watching them all immediately after the movie. On the other hand, you can forget finding a detailed disc content without the books. 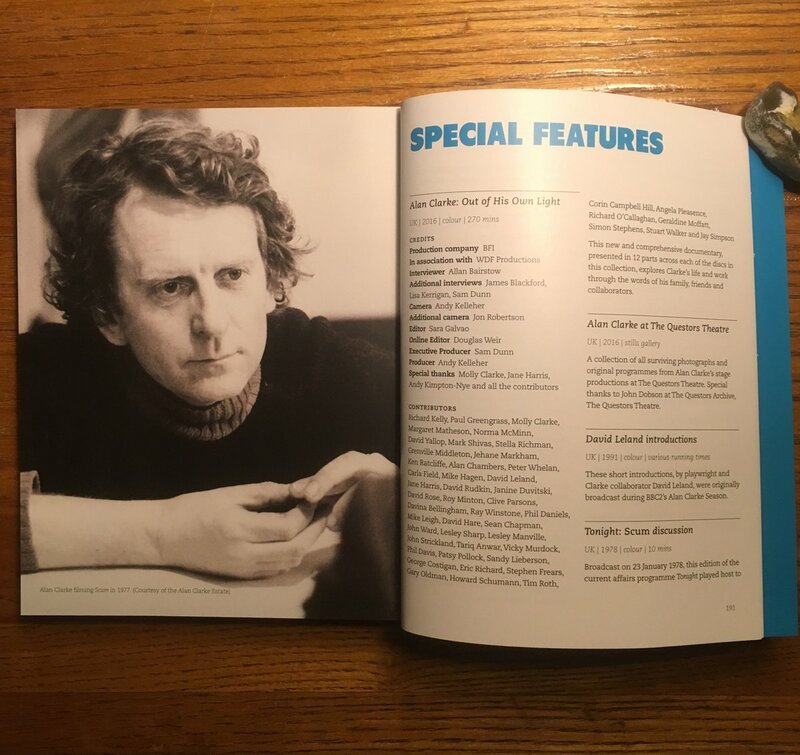 This isn't an issue with the Alan Clarke box, but now that the BFI has adopted the "first pressing only" rule for booklets, there's a clear downside! But space is always at a premium on the reverse of the sleeve - Indicator manages to fit more in (including dates and running times for all extras, plus a brief description), but they've created this extra space by not including a descriptive blurb for the main feature, which some people have complained about (although such a description is easy enough to find on the Powerhouse website). Better to have [had a book] and lost [or lost out] than never to have [had a book] at all? What's the reason for excluding booklets from subsequent pressings? Surely the cost of printing more booklets is trivial compared to the cost of pressing another batch of discs? The costs aren't trivial... and that's the reason. Would you prefer them to leave the discs out? Certainly, the film is better than glossy paper with commentary on the film, if I can only have one! I guess my intuitions are wrong about the relative costs. If I'm not mistaken, the Alan Clarke and Derek Jarman's sets have minimalist individual sleeve designs, so space is pretty much available at least there. I understand not doing so on the belly band (for, indeed, a lack of space) and wanting to keep a minimalist box design, but I'd suppose one could at least try and give some details about the disc split on the back of the individual sleeves. However, in these cases, I suppose the book is always included and when it goes OOP, the whole thing goes OOP, but I find it more practical to be able to have a quick look at each disc content through the sleeve than having to find it within the 200 pages book. It's a very minor complaint though, but I don't know any other label I own releases from that don't at least sum up the extra contents on the sleeve somewhere. which some people have complained about (although such a description is easy enough to find on the Powerhouse website). I've had the issue myself with the miss : I usually build up a pile of "have a look at these if you can find one you want to watch tonight", and without any description or synopsis, it makes it a bit less direct to do so ! Nice! Probably the best deal one can get on Distant Voices, Still Lives and The Glass Shield. Is the Kore-eda box the only July title?